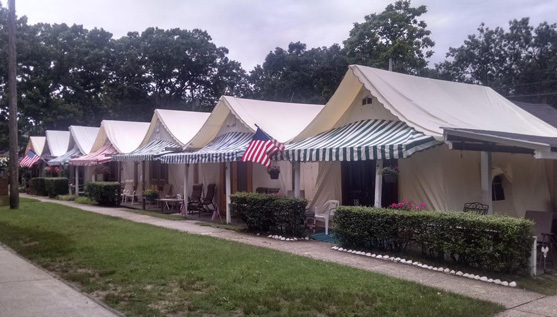 Back over the July 4th holiday, we found ourselves with friends Mike and Carolyn at Ocean Grove, New Jersey, where, every August for nearly 150 years, Methodists have held the largest annual camp meeting of probably anywhere in the world. By the late 1860s, the old-style exuberant camp meetings staged out on the American frontier had largely died out of favor, but the Methodists held on. 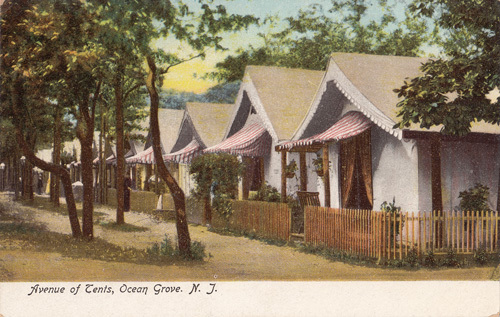 The Ocean Grove Camp Meeting Association formed in December 1869 and carved out a large tract of land right along the ocean, next to Asbury Park, to be a permanent destination spot for evangelicals and their families to spend a wholesome summer vacation and to renew their conversion commitment. Some felt that God had ordained the land for this purpose, as it was just about the only place on the Jersey shore curiously devoid of mosquitoes. Meagan, Rich, and Mike walking towards the Auditorium at Ocean Grove. The large houses at the left and right are a mix of residences and guest lodging. “God’s square mile” they called it—or an earthly “Beulah Land,” like the hymn that was written there in 1875. And it is indeed a remarkable place. Having seen old pictures of the grounds, we had an idea of what to expect, but we were amazed by how little seems to have changed—and not in that way that some places never change because nobody cares. Ocean Grove looks the same, if not better, because it is still a living, breathing town, hosting events, full of vacationers and sight-seers. The houses, hotels, and association buildings—many of them original—are bright and clean and well-kept. People are sitting out on their porches reading or having conversations, never too busy to say “hello” to passers-by. The tents as depicted in a 1904 postcard. A view of the tents today.